I have a double-bowl sink in my kitchen and most of the time, I use only the right side. Just today as I was washing up, I spotted something from the corner of my eye. Something was sticking out of the waste outlet of the left bowl. A closer look and it was a bean sprout! The last I prepared bean sprout was two weeks ago when I was making laksa. A little sprout must have flown over into the waste outlet of that side. 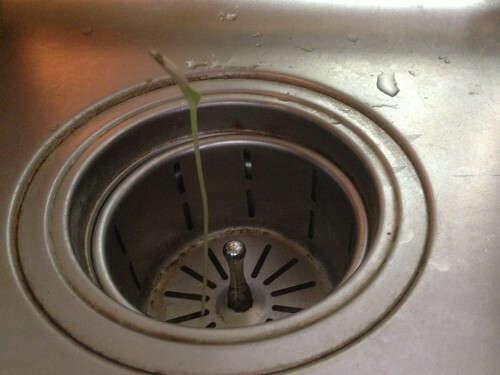 Two weeks later, it manages to make its way out of the sink towards the sunlight. Awesome little wonder of nature. How did it survive soap?? Sheylara: Like Arrenn said, who knows it may mutate and grow into something scary? Have you see The Little Shop Of Horrors? Starmist: Like I said, it was growing from the other bowl of a double-bowled kitchen sink where I haven't been using the left side since I haven't been doing any major cooking that requires that big a wash up.